Press Pass Signature Edition Football returns to the 2004 Press Pass line-up with an autograph and jersey card program that doesn't disappoint. Each 12-pack hobby box contains an average of 8 autograph and 4 game-used jersey cards of the top talent in the 2004 NFL draft. The buzz around this year's draft focused on several QB and WR superstar prospects and Press Pass 2004 Signature Edition Football is the place to find their first autograph cards and game-used jersey cards. The Press Pass 2004 Signature Edition Football autograph roster consists of 56 rookies, including three phenomenal quarterbacks selected early in the first round: Eli Manning (#1 pick by San Diego, traded to NY), Philip Rivers (#4 pick by NY, traded to San Diego) and Ben Roethlisberger (#11 pick by Pittsburgh). Other early first round selections featured in the autograph line-up include WR's Larry Fitzgerald (#3 pick by Arizona), Lee Evans (#9 pick by Buffalo), Michael Clayton (#11 pick by Tampa Bay), standout TE Kellen Winslow (#6 pick by Cleveland) and RB's Steven Jackson (pick #24 by St. Louis) and Kevin Jones (pick #30 by Detroit). Press Pass 2004 Signature Edition also features rare autographs of USC WR Mike Williams, who was projected as an early 1st round pick until a court ruling kept him out of the draft. There are six levels of autograph cards in Press Pass 2004 Signature Edition Football including Class of 2004 Autographs and Autograph Edition Jersey Cards, combining a game-used jersey swatch with each player's signature. These rare jersey cards of Eli Manning and Ben Roethlisberger are sequentially numbered to 25. 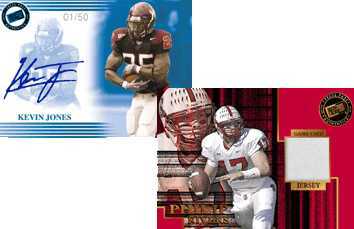 Press Pass 2004 Signature Edition Football has an expanded line-up of collegiate game-used jersey cards versus Press Pass 2004 Football. The game-used jersey roster features 16 players including the first game-used jersey cards of Philip Rivers. There are six levels of game-used jersey cards including Jersey Patch Edition and Jersey Number Edition cards featuring swatches of the player's uniform patch and uniform number, respectively. Press Pass 2004 Signature Edition Football also offers collectors the opportunity to receive an authentic mini-helmet signed by top pick Eli Manning. Redemption cards for the signed Ole Miss helmets, produced by Schutt Sports, are inserted 1:240 in hobby packs. Press Pass 2004 Signature Edition Football features a 40-card premium base set, six levels of inserts, and releases on May 5, 2004.